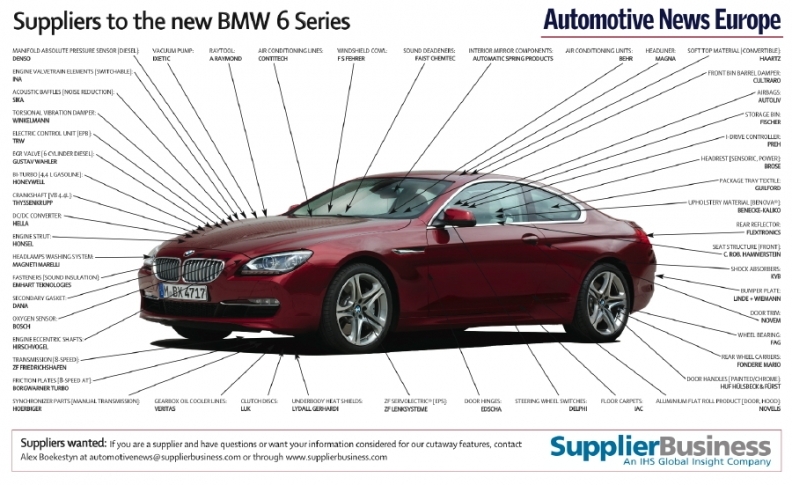 Magneti Marelli S.p.A. supplies the new BMW 6 series with its bi-xenon headlights as standard. The adaptive LED headlights have three-dimensional LED light rings that function as parking lights and daytime running lights. An additional LED light source positioned separately in the headlight housing generates the cornering light, which is controlled according to the speed, the steering angle and the yaw rate of the vehicle when it turns. The cornering light comes from a separate light source inside the headlight housing, which at low speeds ensures that the road is illuminated in the direction in which the car is being steered. Robert Bosch supplies the 6 series' instrument cluster, which features a high-resolution 9.2-inch information display. This system can display information such as mileage, fuel consumption and efficient dynamics data, as well as provide operator feedback from the driver assistance systems and check-control messages. Also contributing to the sporty feel of the 6 series is the A-pillar supplied by F.S. Fehrer Automotive GmbH of Germany. The A-pillars are heavily slanted, making the passenger compartment appear especially flat and making the vehicle seem very close to the road. Contour lines on the hood flow forward toward the kidney grille, creating a V shape that is continued by the contours of the headlights. F.S. Fehrer also supplies the windshield cowl and top cover to the 6-series convertible. Amongst other key components, Federal-Mogul Corp. supplies sealings, pistons and rings to the 6 series, while TRW Automotive Corp. supplies brake lines, power steering lines and the car's fuel delivery module. The 6 series is manufactured at BMW's plant in Dingolfing, southern Germany, on the L6 platform. According to IHS Automotive forecasts, the company will produce 17,000 this year with peak production of 18,000 in 2012, after which volumes will decline steadily.